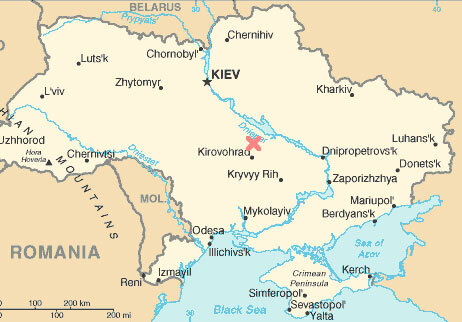 The Boltysh Crater is located in central Ukraine, in the basin of the Tyasmin River, a tributary of the Dnieper River. It is 24 km in diameter, and is surrounded by an ejecta blanket of breccia covering an area of 6500 km². It is estimated that immediately after the impact, ejecta covered an area of 25,000 km² to a depth of 1 m or greater, and was some 600 m deep at the crater rim. The crater contains a central uplift about 6 km in diameter, rising about 550 m above the base level of the crater. It currently lies beneath about 500 m of sediment deposited since the impact, and was discovered in the 1960s during prospecting for oil in the region. When it was first identified, the age of the crater could only be roughly established. Sediments from the Cenomanian (98.9 to 93.5 million years ago) and Turonian (93.5 to 89 million years ago) epochs were found beneath ejecta from the impact, thus setting an upper limit of about 89 million years on the age. Bore samples taken from sediments overlying the crater contain many fossils, and analysis of these dates the sediments at the Paleocene epoch, 65 to 54.8 million years ago. The age of the crater was thus constrained to between 54.8 and 98.9 million years. Later radiometric dating constrained the age further. The concentration of Uranium-238 decay products in impact glasses from the crater was used to derive an age of 65.04±1.10 million years, the first indication that it was of similar age to the Chicxulub Crater. Analysis of Argon radioactive decay products yielded an age of 65.17±0.64 million years. Although the ages derived for Chicxulub and Boltysh are the same to within the statistical errors, it does not necessarily follow that they formed at exactly the same time. At the estimated rate of impacts on the Earth, it would not be extremely unusual for a Boltysh-sized crater to be formed within half a million years of Chicxulub. However, the subsequent discovery of the Silverpit crater and its dating to approximately the same epoch gives greater weight to the theory that the Earth was struck by multiple impactors at this time. The dating of these impact craters is not yet accurate enough to establish whether the multiple impactors arrived over several thousand years, as part of a generally elevated rate of impacts at that time, or were almost simultaneous, like the impacts of the fragments of Comet Shoemaker-Levy 9 on Jupiter in 1994. Another crater to form at the same time was the Shiva crater.